Radikal Talon Trucks come stock with 1/4" screw-in axles. Minimum 172mm width (with stock 1/4" axles installed). Can be expanded up to 210mm with optional axle size upgrades. Hanger and baseplate are crafted from 61-T6 aircraft grade billet aluminum in anodized satin finish -- currently available in black finish with 35 degree baseplate only. Each Talon features two (2) spherical high performance bearings -- one in the hanger and one in the pivot base -- for precision stability and control. Includes Khiro or Tracker Bushings (can be upgraded to premium). Uses standard grade 8 kingpin. Each truck sold separately - order quantity 2 for one skateboard. Axles: The Talon ships stock with coarse thread 1/4" axles installed. Other axle sizes are sold seperately in pairs to achieve different overall width dimensions -- see related items below. 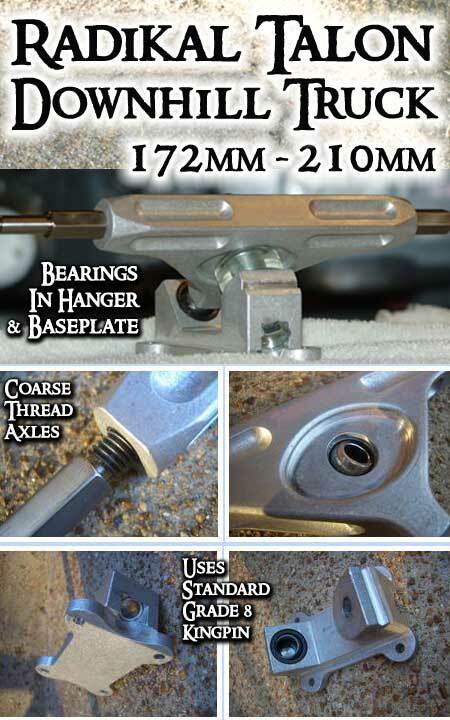 Bushings: The Radikal Talon ships with SK8KINGS custom bushing combo (Khiro/Tracker mix) for stability. (Note -- Radikal brand bushings are out of stock from the manufacturer and not availalble at this time). Reflex or Venom Bushings can be specified as an upgrade (details below). Premium Bushings: Reflex or Venom Bushings upgrade available. Choose option when ordering and specify duro preferences in Notes section or we choose.